The Grand Theft Auto V Special and Collector's editions will retail for $79.99 and $149.99. If history has shown us anything, it's that we can expect Grand Theft Auto games to sell well. Grand Theft Auto IV moved some six million copies in its first week of sales, with more than half of that number being sold on its first day at retail. It wouldn't be out of the realm of possibility for Grand Theft Auto V to do even better. Rockstar, in turn, is already prepping ways to try and convince gamers to pre-order the next iteration before launch. Today, the developer unveiled new Special and Collector's edtions of Grand Theft Auto V.
Customers who pre-order either version of the game can expect a number of exclusive goodies to enjoy both in and out of the game. The Grand Theft Auto V Special Edition will include a collectible art book and a blueprint-style map of Los Santos and Blaine County, where the game takes place. It will also feature in-game perks like a boost ability that will speed up the player's movements, stunt plane trials, bonus outfits, weapons, and access to the Atomic Blimp as a flyable vehicle. 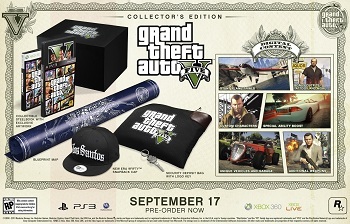 The Collector's Edition will include all the contents of the Special Edition, but will also include a GTA V security deposit bag and key, based on in-game heists, and a baseball cap emblazed with the Los Santos logo. The Collector's Edition will also come loaded with its on unique gameplay perks including classic GTA characters for online play and unique vehicles that can be stored in an exclusive vehicle garage. The Special Edition will retail for $79.99, while the Collector's Edition will sell for $149.99. Both will be available for pre-order until September 17th, 2013. So what do you think? Are the Special and Collector's editions worth the inflated price or should gamers save their money and stick to the standard release?